What took me so long to read this slim but powerful collection of hands on ideas? Sigh. Wonderful. Tried many of them out on the grands this past week, such as: Hold up your finger when you hear a bird song. Another finger for a different bird. Oh, my, is sharpened our listening all week. I have had this book forever, kind of lost on the shelf, always meaning to read it. I'm so glad I finally did. Classic nature sharing book loaded with good ideas, exercises and fun stuff that will teach children about our natural world. It's one of the books used in literature review by the National Association of Interpretation's Certified Interpretive Guide program. This was packed with ideas for games and other ways to experience nature with kids. Most of it was geared to kids older than mine currently are (2015), but it was an awesome resource and one that I will probably buy at some point. Incredible Book. 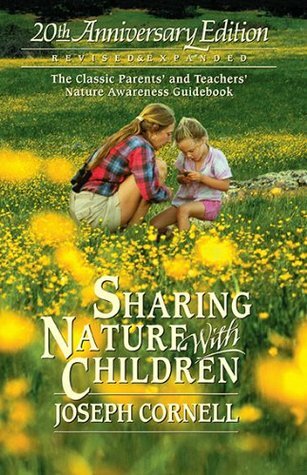 A must have resource for environmental educators, scout leaders, and parents who want to encourage their children to connect with, appreciate and understand nature. Lots of fun, meaningful and easy to lead activities. If you want to raise the nature awareness of your children this is an excellent resource. There were some goofy things in here, but some really great ideas too. I can't wait to try the stethoscope on the tree trunk in the Spring! Easy and fun ideas to teach about the natural world. Outdoor and indoor activities. Detailed instructions. Activities list items/equipment needed.Well laid out book.